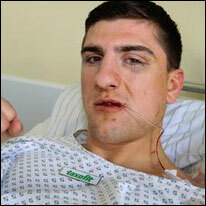 Marco Huck is the definition of the word 'warrior' and he perhaps doesn't get the props he deserves as a legit world champion. Here is a list of some of the opponents Huck has fought, and gone toe to toe with, most of them over twelve rounds. Alexander Povetkin - Huck's best performance? I'd argue so. Yes he lost the fight, but you have to take into consideration the fact that he moved up to Heavyweight and had a brutal twelve round war with the undefeated, Alexander Povetkin, who also weighed twenty pounds heavier than Huck. And some people (including me) thought he should have won the decision. Steve Cunningham - Yes I know he lost this fight as well, and this is the only time Huck has been stopped, but it was his first ever world title fight, and it was against one of the most skilled Cruiserweight's of all time in Steve Cunningham. Denis Lebedev - This is one of several controversial decisions Huck has won. I myself have watched and scored this fight in Lebedev's favour, but it shows you what kind of champion Huck is when he takes on an undefeated and dangerous challenger like Denis Lebedev. Ola Afolabi - Not once, but twice, Huck retained his WBO Cruiserweight title against London-born, Ola Afolabi. Afolabi give it his all and showed us he is a warrior himself in both fights, but Huck's toughness prevailed on both occasions. Brian Minto - The second Heavyweight on the list, Brian Minto is a recognisable face for his four round war with the huge Chris Arreola. He then tried his luck in the Cruiserweight division, but he ran into 'The captain' who dropped him a total of three times, and won by a ninth round stoppage. Hugo Hernan Garay - Garay is a former Light Heavyweight world champion who stepped up to Cruiserweight shortly after losing his title. He won two tune-up fights at the weight and then fought Huck in Huck's seventh title defence, Huck had Garay on the canvas multiple times before winning by a big KO in the tenth. Victor Emilio Ramirez - This was a very special win for Huck. A wide unanimous decision win over Ramirez meant Huck was crowned 'world champion' for the first time in his professional career. Shortly after the fight Ramirez retired from boxing. So seven world class opponents whom Huck has fought within the past few years, and Huck has had five other world title defences which I haven't mentioned. One of them was just last night against Firat Arslan, that fight was the third twelve round war Huck has had this year, and that inspired me to write this tribute post about him. Rumour has it that his next fight could be against Wladimir Klitschko. I hope there's a stretcher or two on stand-by, that's all I'm going to say about that fight. We might be seeing the last of Marco Huck in his prime, like I said earlier, he has had three very tough fights this year, the type of battles that take a lot out of a fighter. All three bouts 'Fight of the Year Candidates' in my opinion. I hope Huck takes a long break from boxing, and then comes back and takes on a 'softer' opponent, but I'd be a fool to believe that.